Hastings United manager Chris Agutter described Jack Dixon’s performance against Cray Wanderers as one of the best midfield displays he’s seen for the football club. 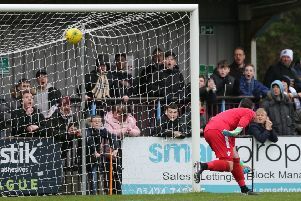 Dixon scored the winning goal and played a starring role as Hastings came from 2-0 down to triumph 3-2 at home to the Bostik League South East Division leaders on Saturday. Hastings have responded to a run of one win in seven matches with back-to-back victories against top seven opposition. “I just don’t think we’ve panicked to be honest,” continued Agutter. “We’ve tried to be calm, tried to keep doing what we do. “While others are a bit twitchy and a bit nervous, we’ve stayed calm and kept our heads. It’s no good panicking, over-reacting and ripping up all the good work we’ve done. “Gary (Elphick) coming in has made a big difference, players coming back from injury and suspension, we’ve now got a full bench of senior first team players. All these little 10 percents have contributed to two decent back-to-back wins. “I think it just reinforces what we believe in and what we’ve done all year. We’ve had hiccups, I think we’ve had our fair share of bad luck if I’m being brutally honest as well. “Today we could’ve had five or six and that’s no exaggeration. I thought we carved them apart for fun to be fair. “It puts us in good stead. It’s a great learning experience. We’re incredibly young. I was talking to their management before the game and they couldn’t believe how young we are. They’re very complimentary about us.